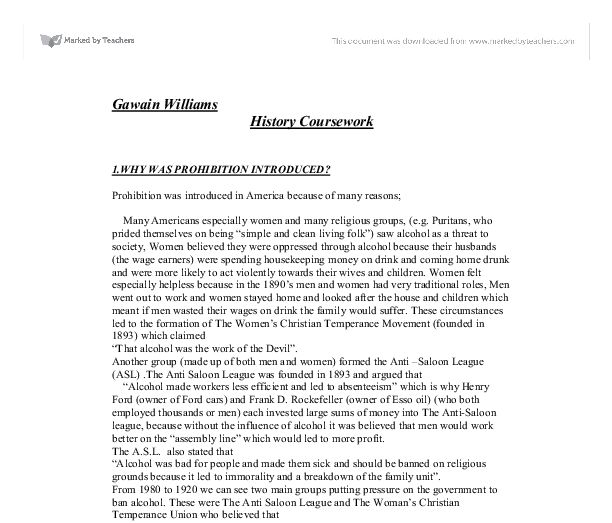 Gawain Williams History Coursework 1.WHY WAS PROHIBITION INTRODUCED? Prohibition was introduced in America because of many reasons; Many Americans especially women and many religious groups, (e.g. Puritans, who prided themselves on being "simple and clean living folk") saw alcohol as a threat to society, Women believed they were oppressed through alcohol because their husbands (the wage earners) were spending housekeeping money on drink and coming home drunk and were more likely to act violently towards their wives and children. Women felt especially helpless because in the 1890's men and women had very traditional roles, Men went out to work and women stayed home and looked after the house and children which meant if men wasted their wages on drink the family would suffer. These circumstances led to the formation of The Women's Christian Temperance Movement (founded in 1893) which claimed "That alcohol was the work of the Devil". 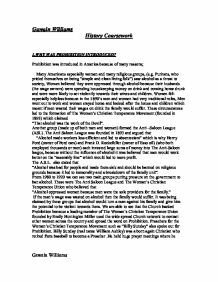 Another group (made up of both men and women) formed the Anti -Saloon League (ASL) .The Anti Saloon League was founded in 1893 and argued that "Alcohol made workers less efficient and led to absenteeism" which is why Henry Ford (owner of Ford cars) and Frank D. Rockefeller (owner of Esso oil) (who both employed thousands or men) each invested large sums of money into The Anti-Saloon league, because without the influence of alcohol it was believed that men would work better on the "assembly line" which would led to more profit. The A.S.L. also stated that "Alcohol was bad for people and made them sick and should be banned on religious grounds because it led to immorality and a breakdown of the family unit". From 1980 to 1920 we can see two main groups putting pressure on the government to ban alcohol. These were The Anti Saloon League and The Woman's Christian Temperance Union who believed that "Alcohol oppressed women because men were the sole providers for the family." ...read more. Men turned to alcohol to save themselves from the reality of their meager existence. Gangsters saw this vulnerability and exploited it .This all led to a rise in crime ,mob violence, the St Valentines Day Massacre .We can also see the growth of the Klu Klux Klan ( a racist group who hated black people, the Jews, Catholics and immigrants). This group was mainly run by white Anglo Saxon Protestants (W.A.S.P.s). Companies such as Ford used this racial tension between black and white workers for their own profit. Forcing white workers to work for lower wages by giving them the impression that they were easily replaceable .There was always a black man willing to do their job for less money. Now that America was in a full depression all classes of Americans looked towards the Government for help. Hoover and his Government had been shown up when the Gangster Al Capone had opened "soup kitchens" for the unemployed .This act brought a degree of glamour to gangsters in general and a lot of people thought it was wrong and ironic that criminals were to be seen doing more for the poor than their own government. Hoover's policy of "non intervention" just made things worse and when Hoover finally did start helping Americans with "the Hoover Dam" (which was a government project designed to give jobs to the unemployed) it was seen "as too little too late." and in 1932 Hoover was voted out of office. During the mid to late 1929's it became clear that there was a rise in health problems caused in part by the drinking of illegal alcohol .This was because some gangs were overseeing the distilling of illegal alcohol, "moonshine gin" or "bathtub" gin, which could cause blindness, kidney damage and sometimes even be so toxic that it could led to death. One of the reasons that gangsters gained so much power so quickly was because some people were willing to pay a lot of money for illegal alcohol to escape the misery of no food, no work and no hope for a few hours. ...read more. This shows that when Prohibition was brought in Hoover (as did most of America) believed Prohibition to be a good idea however as time went on America realized that Prohibition had brought organized crime to their doorsteps. The Wickersham Commission reported (taken in 1931) showed that America believed that "the Prohibition laws were unenforceable and encouraged public disrespect for laws in general" This meant that Prohibition was actually acting as a catalyst for crime because when Americans were breaking one law that they didn't agree with and were getting away with this led them to view other laws with the same laisse faire attitude. Prohibition also led to a wave of organized crime led by several different gangs. Al Capone was one of the most famous Gang leaders of the prohibition era. He dominated Chicago's underworld, dealing in bootleg liquor, extortion, white slavery, prostitution, and other rackets. He also controlled the corrupt administration of Major Bill Thompson. He was finally indicted for federal income tax evasion in 1931 and was sent to prison. The passing of the 19th Amendment meant that American women were now able to vote. Women tended to vote against prohibition Pro alcohol propaganda was also being spread saying that alcohol had "therapeutic value" "had no harmful effect on fertility" and "most medicines contained some alcohol" With better medical knowledge we now know all of the above to be incorrect and in fact the complete opposite to be true however at the time it was Damaging to the Republic party because many people believed that they had been lied to when prohibition was introduced. After thirteen years it was clear that Prohibition was not working and the Eighteenth Amendment was finally repealed by the Twenty First Amendment. Once Roosevelt had won the election he said "I think it's time for a drink" and in his "one hundred days" in office he brought an end to Prohibition. However A number of states continued enforcing prohibition for a time, but by 1966 no prohibition laws existed. Gawain Williams ...read more. The AAA (Agricultural Adjustment Agency) could be considered one of them. Thanks to this scheme farmer�s incomes doubled between 1933 and 1939. This scheme consisted on paying farmers to produce less food, by taking land out of production or reducing their lifestock. This worked very well and Wheeler lobbied clergymen and politicians alike. The ASL got a lot of support for its campaign from the churches, which meant that prohibition could be preached in the churches and give the ASL more ways of telling people about prohibition. Many people were so desperate they committed suicide. Thus ended the boom years and Americas prosperity. Throughout the next three years American industry sank deeper and deeper into depression. Many people thought up their own individual reasons as to why this disaster had happened. that prohibition would come to good and instead it came to be a costly mistake, but if this source was to be inevitable for the failure of prohibition why would this letter say right from the start that he hoped for a stable no alcoholic society and then go on to say that it failed. The nature and the causes of the Great Depression of 1929 in America.